I love my garments to look as beautiful on the inside as they do on the outside, which means no raw edges hanging around anywhere! 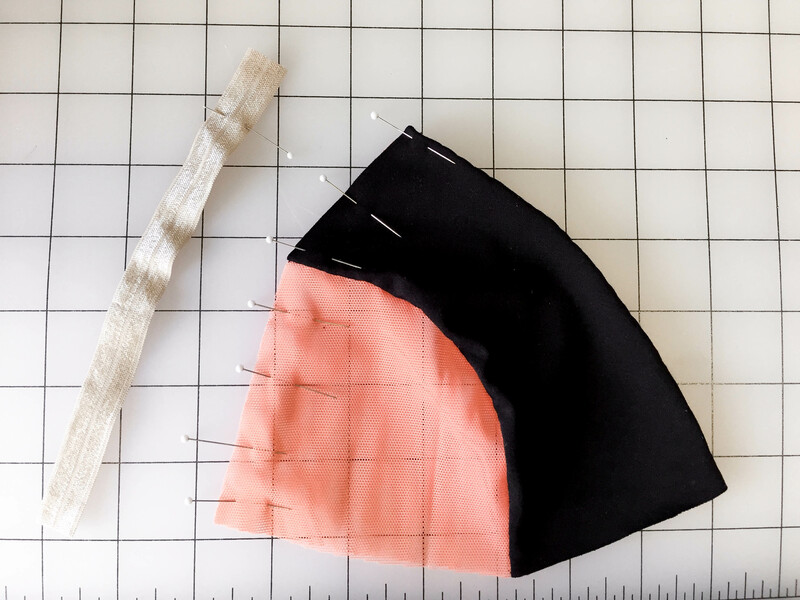 Here’s a great way to apply a decorative stretch trim to the front of a garment and keep your edges nice and pretty with just a regular sewing machine!! 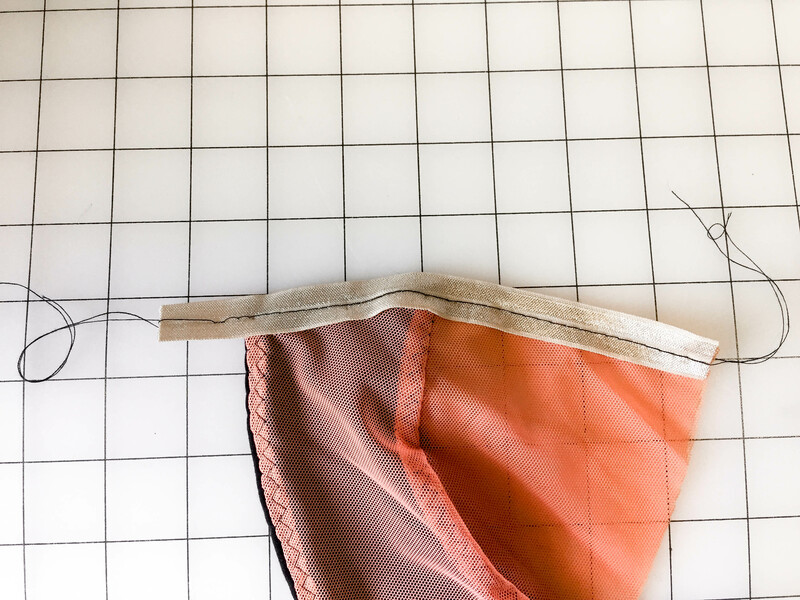 This is the method used for the elastic on the Euler Bralette! 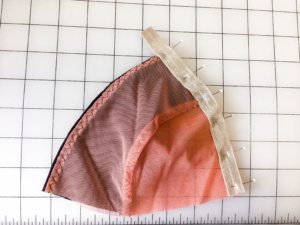 Here is our bra cup and the elastic that will finish the side. I’ve pinned the edge of the cup because there are two layers, the cup self and the cup lining, and I don’t want them sliding around while I put the elastic on. 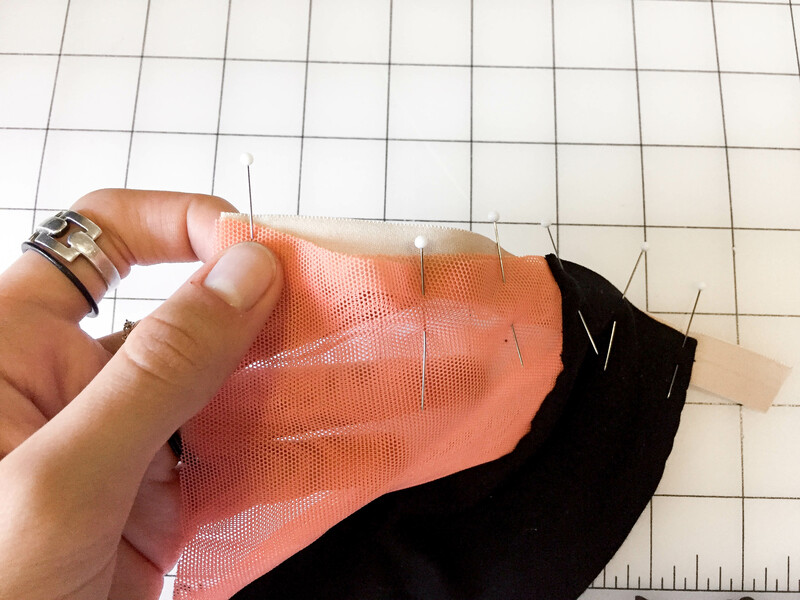 Pin the elastic to one edge of the Back of the garment, wrong sides together. Keep the edge of the fabric about 1/16-1/8” from the edge of the elastic. This keeps the seam allowance from peeking out when we fold it to the right side later. Pin the other edge, again keeping the fabric 1/16-1/8” from the edge of the elastic. 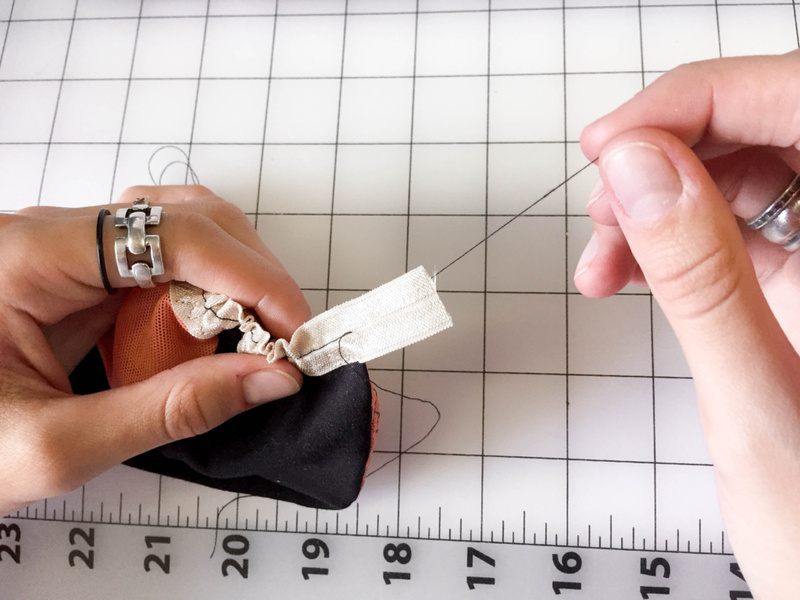 Stretch the garment and elastic together so the materials are evenly dispersed. Pin in the middle, then work your way out to the edges. 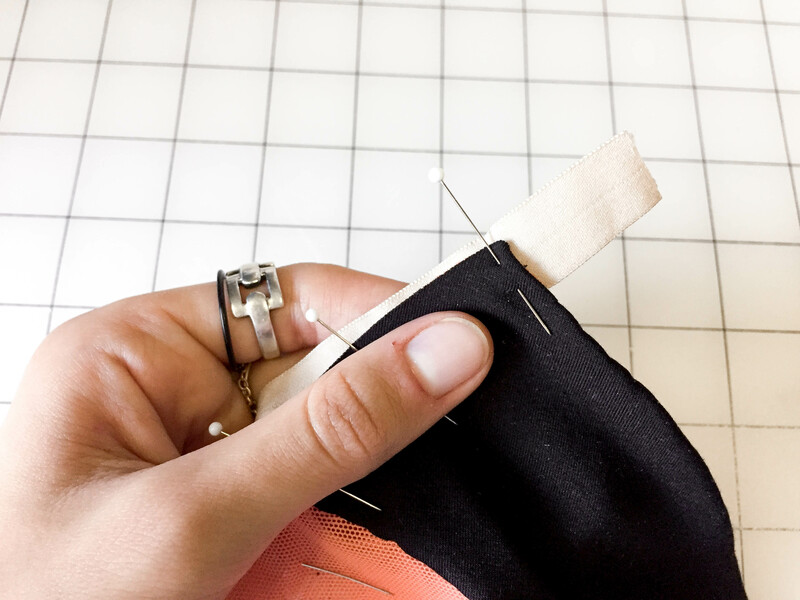 If you’re applying trim to something that is already in the round, such as a skirt waistband, sleeve hem or neckline, sew your elastic into a circular band, then measure and mark your material and elastic band into quarters, then stretch and pin evenly. This will keep the elastic and material even all the way around, and allow you to keep your elastic exactly the length you want it. Ready for basting! Note that the edge of the fabric is straight and even along the elastic, and there are no excesses or tight spots between the fabric and the elastic. This is the best way to make sure that the two will be sewn together with exactly the right amount of tension and ease. Baste along the center of the trim with a contrasting thread. This will make it much easier to remove later, and help keep you from snagging your delicate trim if you have to use a seam ripper. If you have any seam allowance peeking out past the edge of the elastic, now is the best time to trim it! 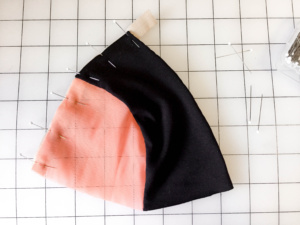 Fold your trim to the right side of the garment. 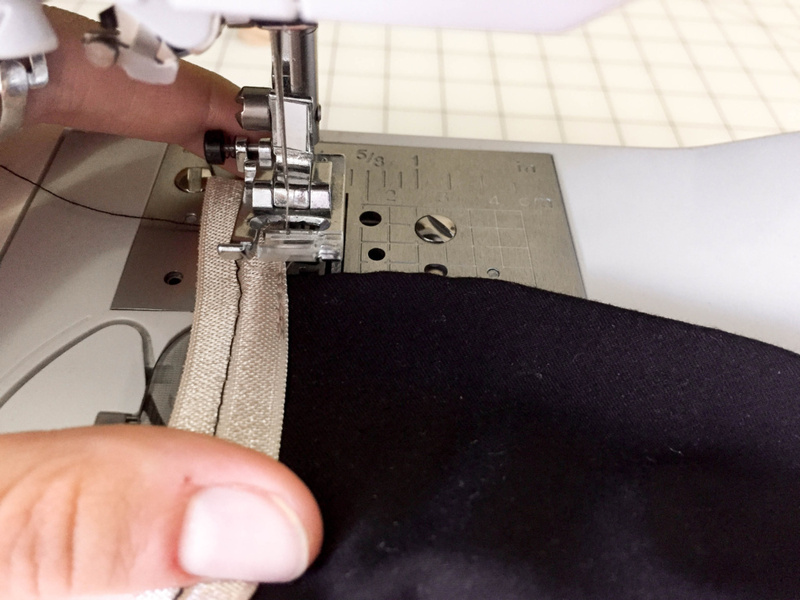 If your trim is going to extend off the edge of the garment, (if it’s a strap, tie, or in this case, will have a ring or strap slider connected to it) reinforce the inside edge where it meets the fabric using a straight stitch- start at the top and sew about 1/2” then backstitch back up to the edge of the fabric. 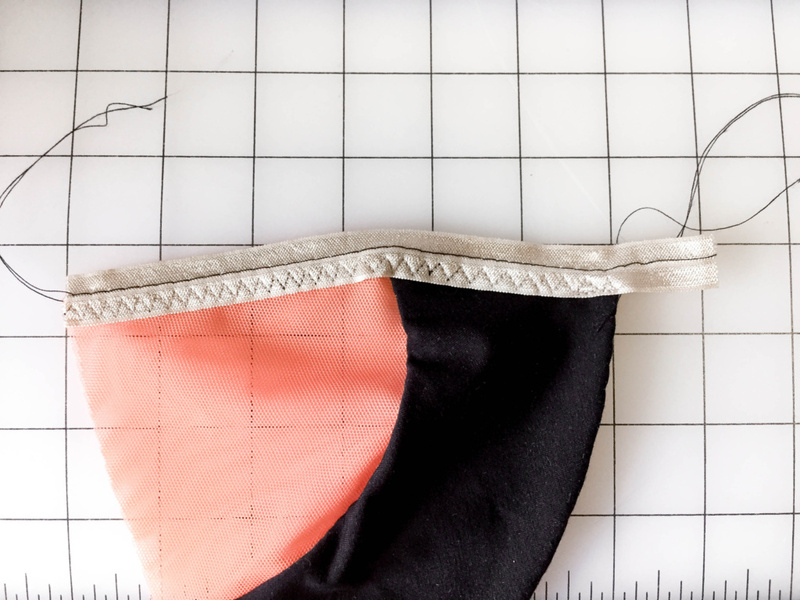 Zig zag down the trim on the inside edge, being careful not to sew over your basting. That would make it more difficult to remove! I love the three step zig zag stitch- it allows much more ease for the material to stretch without breaking your seam. It’s also great because it can be really wide while still totally securing the fabric. 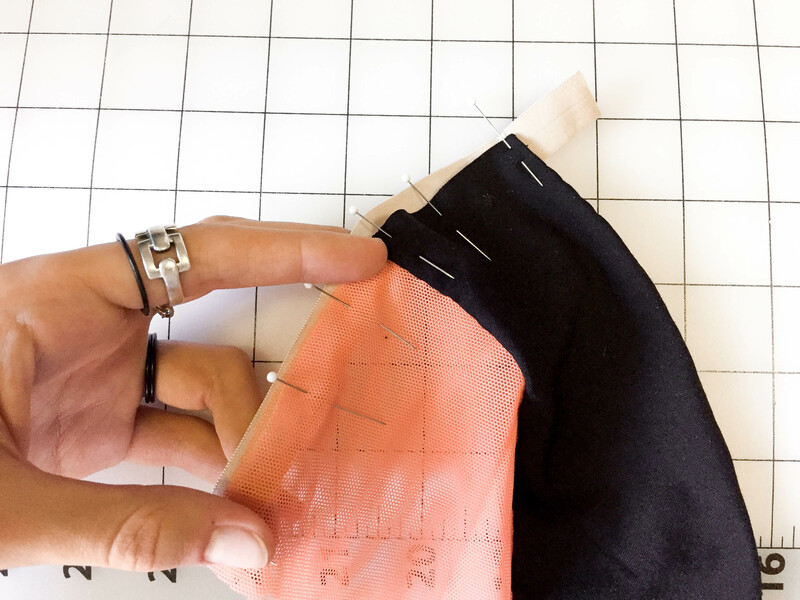 Whatever type of zig zag or stretch stitch you choose, make sure it’s wide enough to catch your seam allowance underneath it, which is the goal of our project! Pull one of the basting threads like you’re gathering your fabric, then pull it all the way out! My machine makes the bobbin thread much easier to pull- do a couple test seams to see which thread is easier to pull on your machine! Pull carefully, so you don’t break the thread inside the garment. Voila! A beautifully applied trim with beautiful seams inside and out! It’s a great technique to apply to elastic waistbands, tank top straps and edge finishing, necklines, the hems of stretchy pants, underwear, just about anything!!! 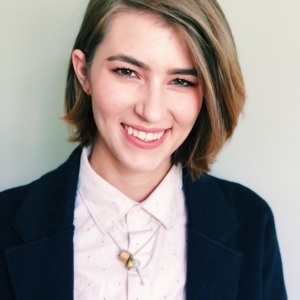 This tutorial was originally featured in Seamwork Magazine.